Established in 1973, the Montreal Children’s Hospital Foundation is a donor-centered organization that supports the Montreal Children’s Hospital, the first hospital in the province of Québec dedicated entirely to pediatric care — established in 1904, the hospital is a “global leader in pediatric medicine and has a ground breaking multiculturalism program, offering services in French, English and 45 other languages”. The foundation has raised over $428 million to support its mission to “inspire and mobilize the community to support relentless innovation in research, teaching and care at the Montreal Children’s Hospital”. 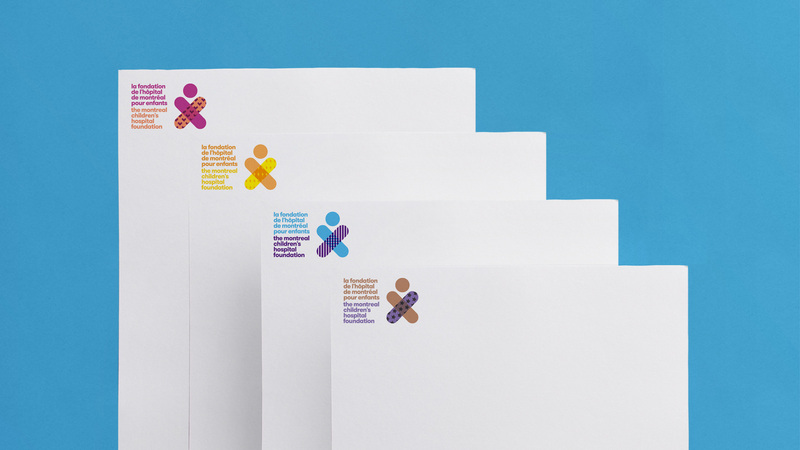 This month, Montreal Children’s Hospital Foundation introduced a new identity designed by Cossette. 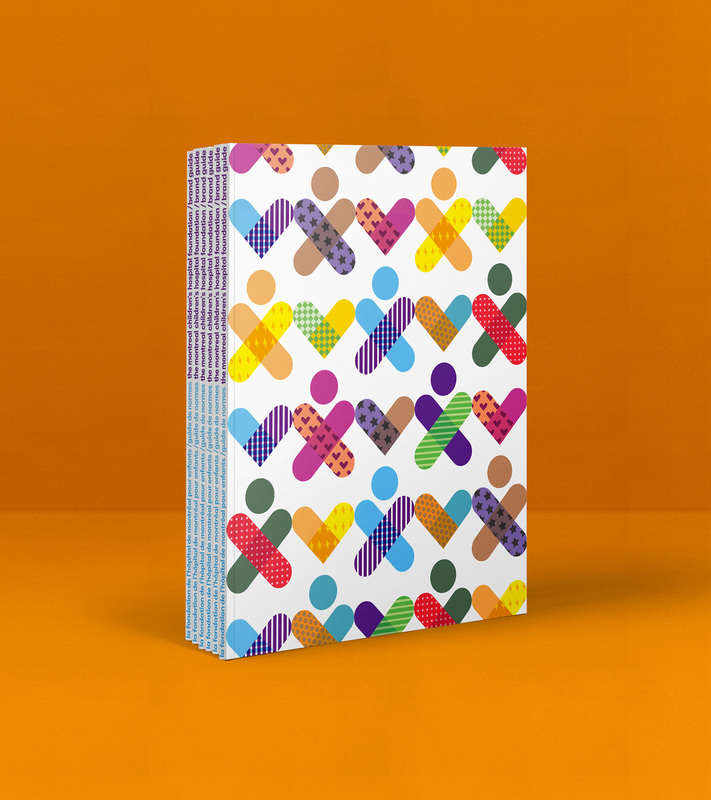 Representing the figure of a child, the logo consists of a single band-aid to symbolize the Hospital’s core mission to heal children and ease their suffering, and a band-aid heart to represent the love that flows between our patients and our medical staff. Joined together, they form an icon that stands for the unbreakable bond between donors, patients and their families, and the Hospital. Logo in French and English. 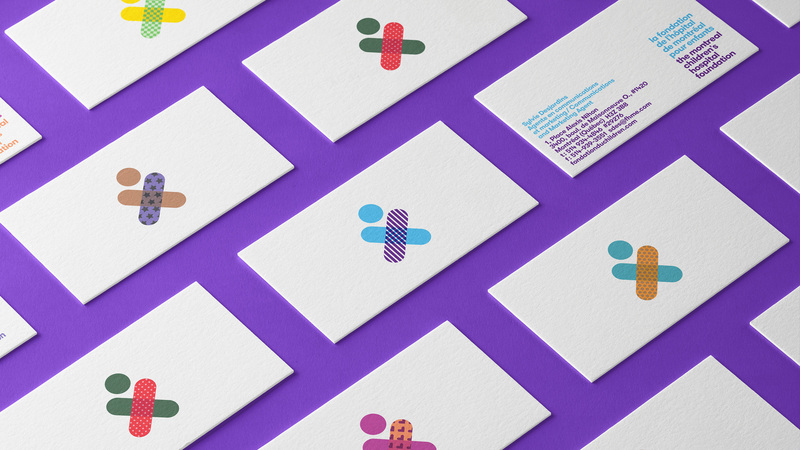 Graphic elements for Heal, Love, Bond (Guérir, Aimer, S’unir). As usual, I feel bad for saying negative things about old logos for good organizations but the old logo was pretty bad. The idea of using paper-cut children was perhaps good but the execution of them on a cube ruined the concept and resulted in a very awkward icon. 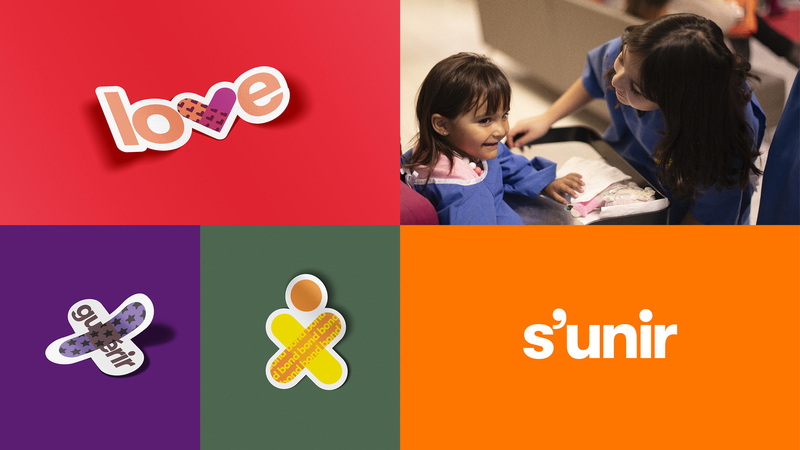 The new icon is a charming, colorful abstraction of a child figure that uses the easily recognizable traits of a band-aid — or adhesive bandage, since Band-Aid is a trademark name — to create an instant connection between healing and kids. The execution is excellent, using a simple pattern change at the intersection of the two shapes to create the soft-padded-y part of the band-aid. The proportions of the icon are spot on, with the head just slightly bigger than the thickness of the × and nicely nestled between it. You would expect these things to be the case but it would be pretty easy to get them wrong. 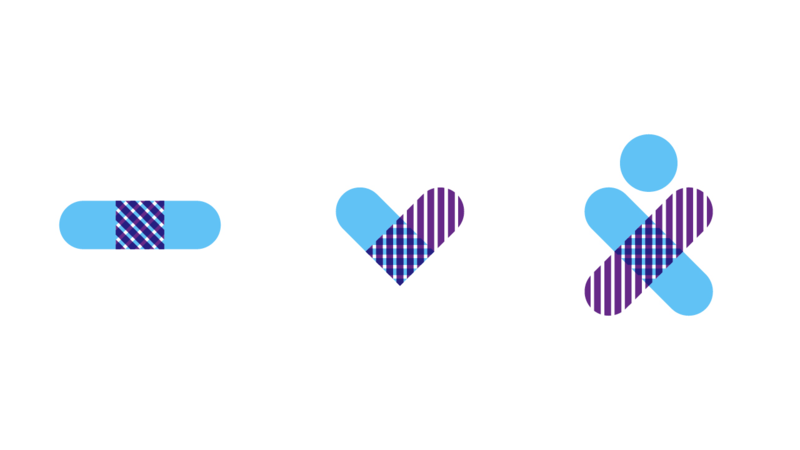 The pattern variations of the icon are great and pairing the icon with a heart graphic as part of the identity makes for an endearing, easy to understand message without using any words. The wordmark, in GT Walsheim, is fine but the all-lowercase approach in a name that’s almost a complete sentence on its own, especially one that contains a proper noun (Montréal), is not entirely convincing. [On October 31, students from Montréal primary school École Saint-Barthélemy collected donations to organize a blowout Halloween party for kids at the Hospital. 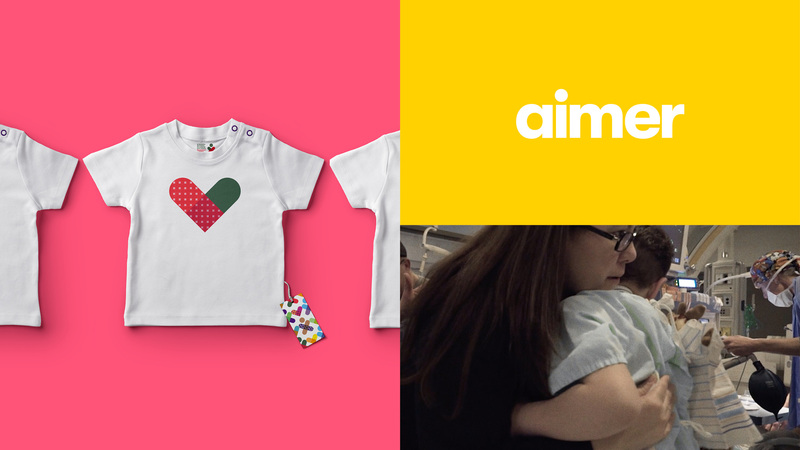 “When you see five to eight-year-olds willing to trade their princess or Harry Potter costume for a hospital gown to help other children, it makes us adults want to chip in too,” said Vicky Morin, creative director at Cossette. Thanks to the generosity of the students and the people who donated to the cause, the children at the Hospital enjoyed a magical event that included shadow puppets, an oversized piñata and giant interactive costume, a message from Foundation spokesperson and hockey player PK Subban, and a wheelchair race. Halloween feel-good video. Even if your cold soul lives only to point out other logos that look like the one in any given post, you will feel some actual human emotions after watching this video. 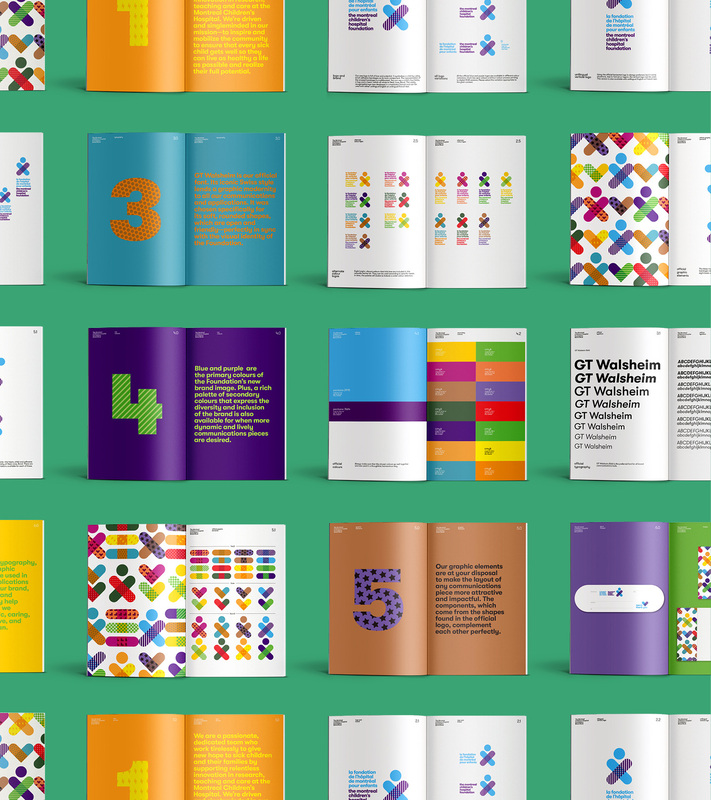 The applications — real and imagined — are all quite nice and have a great balance of being both serious and fun in a way that still conveys that this is a foundation with a financial purpose but one that’s doing it while spreading as much joy as possible and reminding its audience and donors that the effort is for children. Established in 1973, the Montreal Children's Hospital Foundation is a donor-centered organization that supports the Montreal Children's Hospital, the first hospital in the province of Québec dedicated entirely to pediatric care -- established in 1904, the hospital is a \"global leader in pediatric medicine and has a ground breaking multiculturalism program, offering services in French, English and 45 other languages\". The foundation has raised over \$428 million to support its mission to \"inspire and mobilize the community to support relentless innovation in research, teaching and care at the Montreal Children's Hospital\". 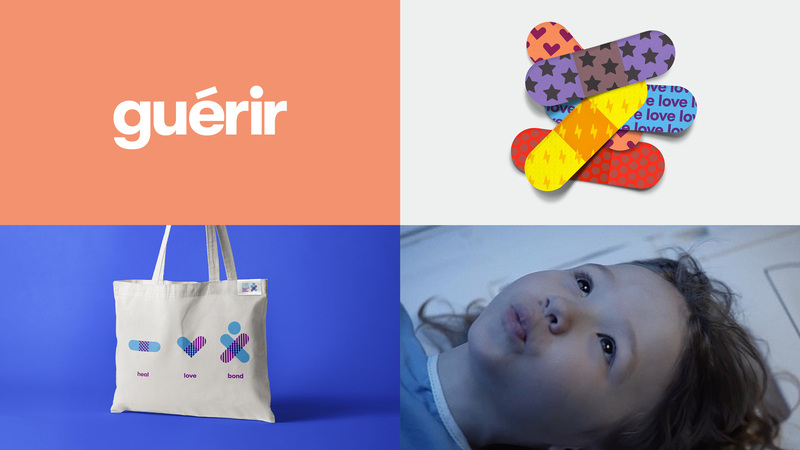 This month, Montreal Children's Hospital Foundation introduced a new identity designed by Cossette.